Over the years NASA satellite images of the Red Planet have shown some strange and often disquieting objects. 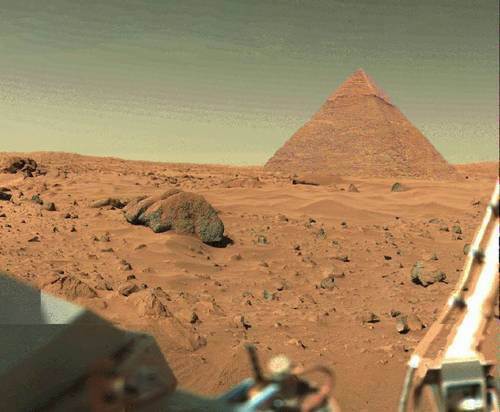 Now, a stunning raw NASA image of a pyramid on the Mars surface has once again fueled speculation that Mars used to be the home of an alien civilization. The astounding image of the Martian pyramid was captured on May 7, 2015 by NASA’s Mars Curiosity Rover, striking a peculiar likeness to the Great Egyptian Pyramid. This Martian pyramid is about the size of a “small car.” Mars enthusiasts speculate it is only the “capstone” of a gigantic pyramid that once towered on the Martian landscape, but is now buried by eons of sand. What stands out about the photograph is the symmetry. A telltale sign that differentiates a natural formation from a manmade one is its angles and lines. 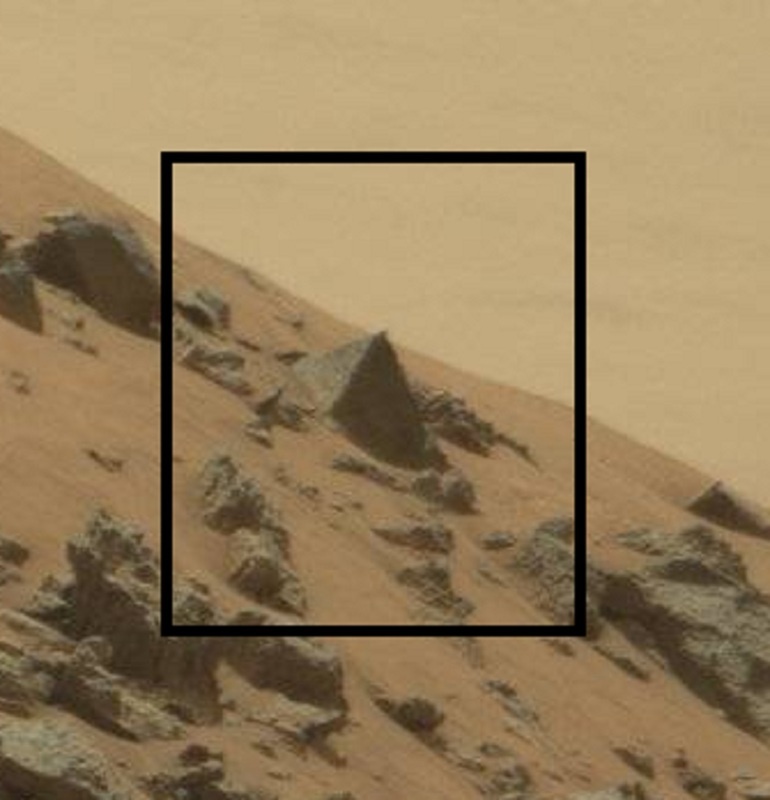 Additionally, this pyramid image belongs to one of the very clearest images captured on Mars. This artificial structure clearly points to evidence that a civilization once existed on Mars with the capacity to build such a pyramid. The image’s original timeframes spanned over 20 to 30-second intervals. 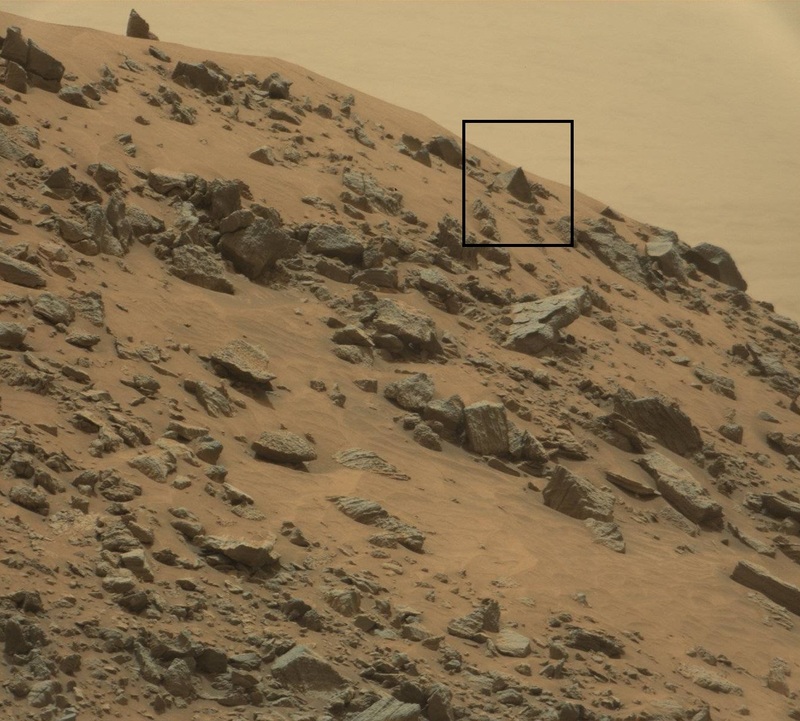 Strangely enough, the photos taken by the Curiosity Rover immediately following the initial pyramid photo did not include the pyramid, causing even more speculation. Conspiracy theorists point to the lack of follow-up photos of the pyramid on Mars as proof of NASA’s avoidance in providing proof that life, and a probable advance civilization, may have existed on Mars long ago, or probably even now. 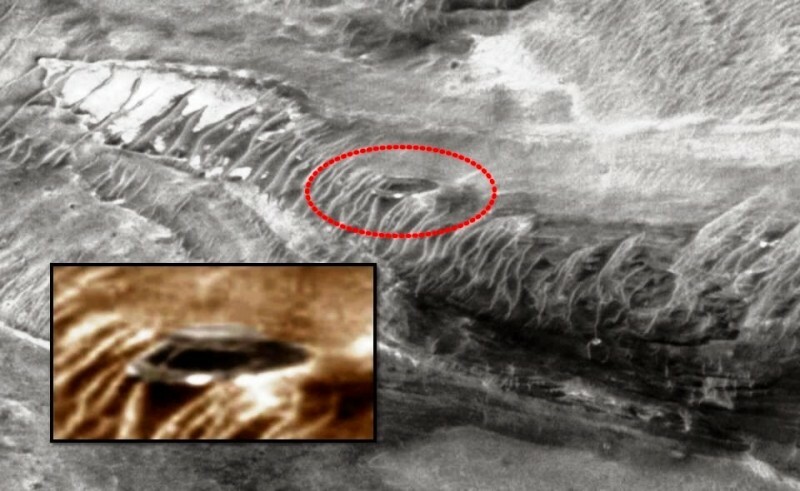 One such was a Global Surveyor Image from 2000 that depicted the base of a “flying saucer” that is nestled on a cliff, and has no discernible damage. Again, symmetry offers a hint. Allegedly, this spacecraft had what appeared to be observation windows. As stated by previous NASA employees, the agency operates under a veil of secrecy, and much of what really is taking place on Mars and other planets is shielded from many workers, except those on a need-to-know basis. There are even stories from past staff members who claim to have knowledge of covert Martian programs and space bases. Other images have been found on Mars that support the belief that this planet once held intelligent life. 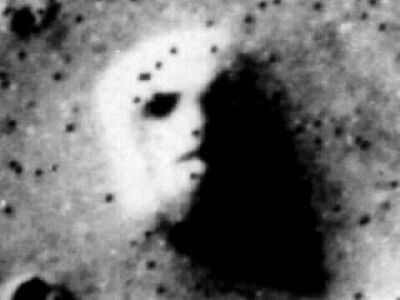 The famous face on the Cydonia region of Mars was discovered in 1976 by the Viking 1. NASA has officially dismissed it as a natural rock formation. Looks sculpted to me. Could it be some type of aerial welcome (or deterrent) beacon to strangers approaching from space? Mars researchers continue to pour over thousands of NASA images as if looking for the Holy Grail. The scrutiny has turned up some interesting finds. The Mars Anomaly Research Project points to water, biological, and civilization evidence on Mars—along with signs of past warfare. Back in 2011, Brandenburg first postulated that the red colour on Mars could have been due to a naturally occurring thermonuclear explosion. Brandenburg also believes Mars once had an Earth-like climate home to animal and plant life, and any intelligent life would have been about as advanced as the ancient Egyptians on Earth. From the newly discovered pyramid on Mars, he may be right. Ancient Sumerian texts indicate that a planet called “Tiamat” was struck by a large planet, which moved it into its present orbit, and also created the Earth’s moon and the Asteroid Belt. This large planet, which the Sumerians called “Nibiru” (known as “Marduk” by other ancient texts), came into the solar system on its 3,600-year clockwise (retrograde) elliptical course and struck Tiamat which was moving in its ordained counterclockwise orbit. Mars is said to have suffered the nuclear fallout of Tiamat’s catastrophic demise, decimating all life on the Red Planet. Much has been lost about our ancient and planetary history, so we have to look to the ancient texts to provide clues. More thorough exploration of Mars may provide some of those answers—or it could leave us with even more baffling questions. Stay tuned. UPDATE: For those who have asked if this story is real, CNN and other media outlets around the world released this story earlier this week before I did—Google it. NASA just released another pyramid-looking object found–but this time on Ceres. CLICK HERE to hear NASA’s own people talk about it on the CNN news website.